Gabriel Canepa is a Linux Foundation Certified System Administrator (LFCS-1500-0576-0100) and web developer from Villa Mercedes, San Luis, Argentina. He works for a worldwide leading consumer product company and takes great pleasure in using FOSS tools to increase productivity in all areas of his daily work. When he’s not typing commands or writing code or articles, he enjoys telling bedtime stories with his wife to his two little daughters and playing with them, the great pleasure of his life. For some guest operating systems, a “Guest Additions” package of device drivers and system applications is available which typically improves performance, especially of graphics. 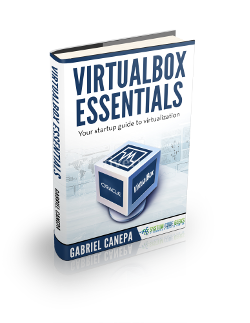 In this ebook, we provide a compilation of VirtualBox tutorials that will help you get started with this virtualization platform. We cover a wide range of topics, from installing the software and performing a basic configuration, to cloning, exporting, importing, and removing virtual machines. With our straightforward tutorials, you will be able to get your own Virtual Machines up and running in minimum time. Please login to access this download. JCG eBooks are professionally designed, downloadable collections of popular JCG content – articles, interviews, presentations, and research – covering the latest software development technologies, trends, and topics. Comments Off on VirtualBox Essentials Views Tweet it!